On Wednesday, 4 July, I returned home. I am not the most patriotic person, but seeing the red stripes flying in the sky was a welcome sight, and I really think that returning home on Independence Day was fitting. My plane landed around 4 p.m. in South Bend. Rebekah picked me up from the airport. We stopped by a friend's house in Bremen. His dad is quite a talented homebrewer. It was the first good beer in 6 weeks. A fine welcome home. A number of friends were there as well and we shared stories of goings on over the past 6 weeks over fine homebrews and brats. In the evening were fireworks. A fine first day back home in America. In the morning I walked to the hardware store. I never realized how beautiful Syracuse was. 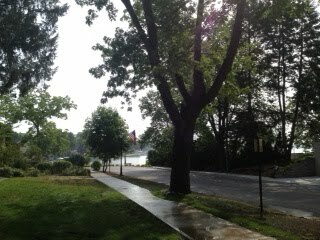 Huge, deep green trees, the lake around the corner, American flags lining the streets, and flowers hanging from the lampposts. Some of my sentiments are certainly just the feeling of being home, and some of it is that I am in a small town and not a large city. But I really think I appreciate small town Indiana and America in general much more than I did 6 weeks ago. My wife, family, home, history, roots, friends, and life are here. It is also green and lush, even in the drought. And part of it is that I can flush the toilet paper again. And there is not a shred of trash on the street and not a hint of grafitti on the wall. The streets are calm and mostly empty. Now if only Indiana had history or an Orthodox Church on every street corner. I spent a few days relaxing. 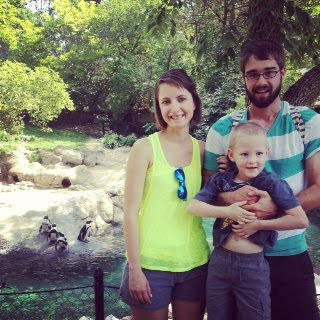 On Saturday, Rebekah, Jerusalem (my godson) and I went to the zoo in Fort Wayne. It has been a yearly occurance since our engagement 4 years ago. On Sunday, we baptized our new goddaughter Genevieve, Jerusalem's baby sister. Although our little parish can't hold a candle to anything I saw in Greece, it is wonderful to be home. Monday, I drove 12 hours and 650 miles to New Jersey. The drive was uneventful, besides too much construction in Pennsylvania. 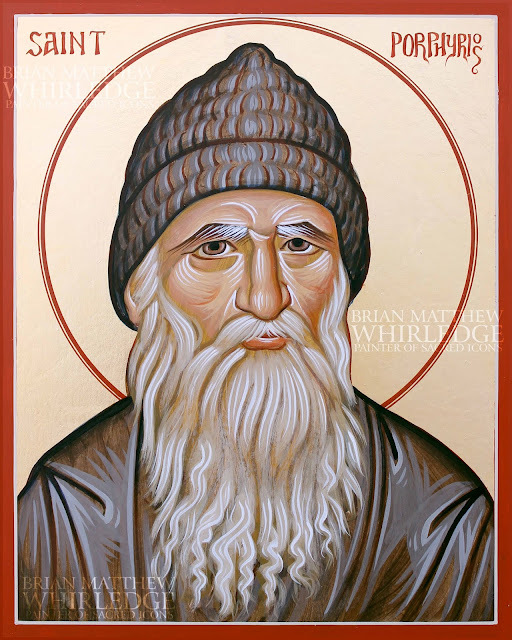 I listened to half of "The Night Circus" by Erin Morgenstern, several episodes of the podcast "Orthodoxy and Heterodoxy" by Father Andrew Stephen Damick, and a lot of music. The drive gave me a lot of opportunity to reflect on my time in Greece and what I have brought back from it. Specifically, I am thinking about ways I can bring what I saw back to our little country parish in Indiana. This fall, my goal is to split the choir το chant antiphonally and teach them Byzantine notation (watch out!). I spent the evening talking to my inlaws about the trip. Yesterday, Tuesday morning, I waited until rushhour passed, and left for New York. Traffic was a piece of cake at 11:00 a.m. Tolls were another matter: $12 to cross the George Washington and $6.50 to cross Throg's Neck. 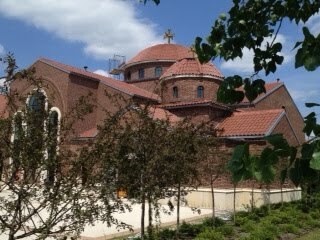 After two hours and emptying my wallet, I arrived at Archangel Michael Greek Orthodox Church in Port Washington. I could'nt miss it from the road: a huge brick and tile dome with a cross. Although distinctly American, It looks like it would belong in Greece. The $17 million facility is still bustling with construction activity. I wandered in amongst construction workers and found the nave. 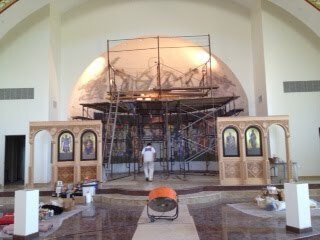 Tom Clark was working on the scaffolding, adding finishing touches of charcoal to a multicolored chalk drawing high in the apse. Below, the Communion of the Apostles is mostly finished, and covered with plastic for protection. He descended and we made introductions. He grew up in Chicago and his wife grew up in Grand Rapids, MI. 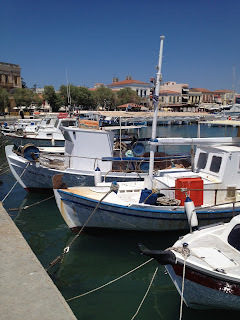 They moved to Greece because of the spiritual and historical richness of the country. 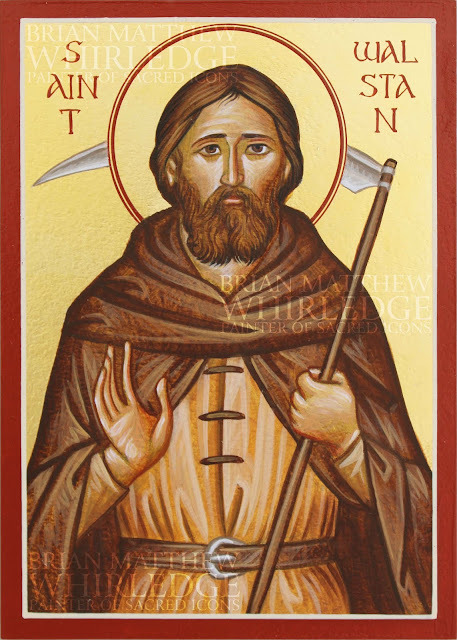 He has five sons; the oldest three (20, 22, 24) are tonsured monks and used to assist him on projects such as this church. His faith is apparent in conversation. 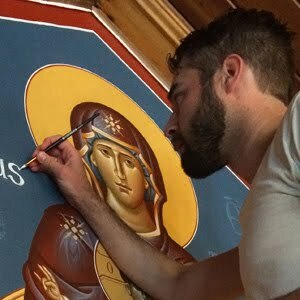 "The number one thing about painting a church is to be reverent. When you are painting a church, you are inside the heart of Christ. It is a gift." He introduced me to the priest, Father Dennis. Tom has known Fr. Dennis since he was a boy in Chicago. Tom and I ate lunch at a nearby diner. I ordered a philly cheese steak. As much as I love Greek food, it is good to be back and enjoy something purely American. We finished lunch with a chocolate milkshake (Chicago style, a real milkshake, not the Boston style). 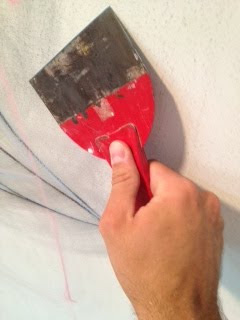 We returned to the church and I began my first task: scraping the walls. 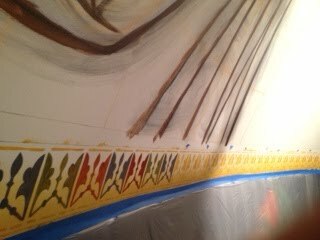 The walls must be scraped to remove any bumps as well as to burnish, compress, and smooth the surface in preparation for gold leaf. The wall is brand new finished and primed drywall and is a very nice surface. While I scraped (and try not to gouge or scuff), Tom went over the lines with a dark red paint. Each figure has multiple drawings, each done with a different color chalk. The first drawings are a light yellow. He made adjustments with blue and red and finally charcoal. Last, he added a bold painted line which will show through the layers of paint. After hours of scraping, I was covered in white flakes. Around 9:00 p.m. we went to Father Dennis' house to take showers. Presvytera (the Priest's wife) fed me still-warm leftovers from dinner while Tom showered. I had pork chops, peas, carrots, artichokes, and salad. I showered and we were on our way. We stopped by a grocery store to get water, fruit, cereal, and milk. We got to talking and somehow the fact that Ι grew up on a farm came up. He was fascinated that the earth keeps producing rocks that need to be removed so equipment isn't damaged. We called it a night. By morning, my air mattress had entirely deflated. I found the hole; I hope scotch tape is enough. 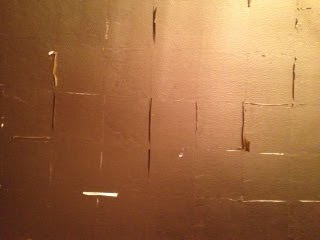 I began painting a wallpaper sizing over the area where the gold will be applied. The sizing seals the surface so the adhesive will dry evenly. 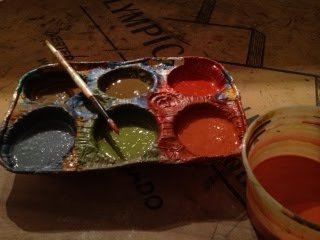 After the first coat (it takes 2 hrs to dry) I began on a border. The first step was a gradient from white to ochre. About the time I finished that, it was time for the second coat of sizing. Meanwhile, Tom drew and cut out the stencil for the border. I ran out to Whole Foods to pick up some things for lunch. After lunch, I began sponging a yellow ochre through the stencil to create the border. Tom applied a small section of glue and painted some base colors to the icons. In the evening, I began to paint the border in the complicated pattern. 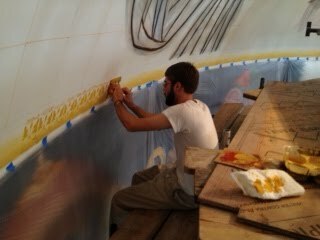 When the glue had set for an adequate time (5 hours) to become tacky, Tom began to apply gold leaf. Tomorrow, he will wake up early to apply the glue so it can be ready by mid morning. I stayed up late working on the border.